A little google mapping last night got me wondering again (that I should have been a cartographer…yeah, yeah, I know). Seriously though, my geo-nerdiness pointed me to this question. What are the longest point-to-point drives one can take without leaving a state (or county, or heck, even city). Now, we must establish some ground rules here. At first I looked at drives from cities, towns or communities from one extreme corner to the opposite extreme corner. But one can start from and extreme border entrance and drive to the opposite extreme border exit just to extend the fun a little further. Another rule – even though the quickest point may be to jump to another state or two to hop on an interstate or major U.S. route, you must stay in the same state to get from point A to point B. There are some issues here where this can be a problem (note the famous Kentucky Bend or Michigan’s lost peninsula and Washington’s Point Roberts and Minnesota’s Northwest Angle also present some international problems). For states with exceptions like those, we can grant them two qualifying routes, one within the state and one including the exclaves and enclaves. Circuitous routes also don’t count. The drive must take place on the presumably quickest route from each point within the state’s boundaries. Sure one can traverse as many roads as possible in California without criss-crossing and be out there for days, but that’s not the point of this. Essentially what is the longest route in a state for two points that is also the fastest route between those two points. So what is the longest point-to-point drive within one state? Well, that’s not too hard. Using the Dalton Highway/North Slope Haul road in Alaska, the answer is…. 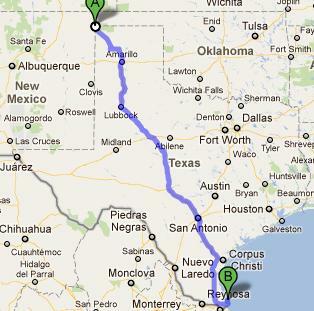 1,099 miles. 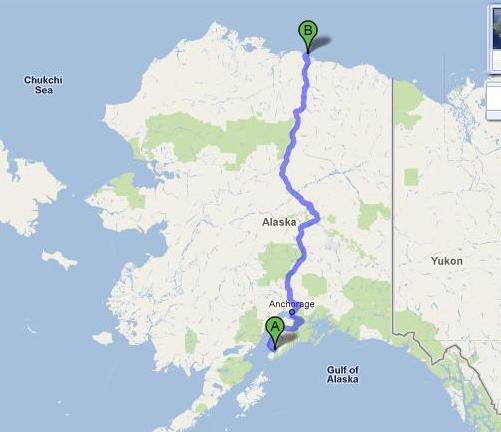 One must start on the end of Homer Spit Road in Homer, AK and go past Deadhorse, AK and onto Prudhoe Bay on “Spine Road” (a restricted usage road according to google) that seems to take one all the way to the North Alaskan coast (see picture above). But that was too easy. 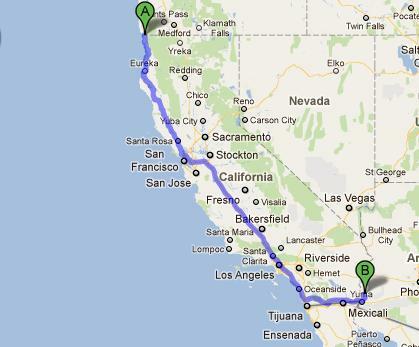 What is the longest possible drive in any of the lower 48 states? Well there are some good candidates here. Let’s look at a few that I calculated to round out my the top 5. Wow, California comes damn close. I started travel from the end of Elias Way in Smith River, CA. If one wanted to travel from here to the end of Ferguson Road in Southeast California (to see Ferguson Lake, of course), you’d easily top 1,000 miles without leaving the state. It may be possible that a longer point-to-point route exists, but this was the longest I’ve discovered. Texas was surprisingly short of the 1,000 mark. The longest I could find started at the extreme NW corner of the state where the Texas State Line Road snakes into Texas below the intersection with Rt. 56/64/412. From here one must traverse all the way down to South Padre Island to the terminus of Ocean Blvd. 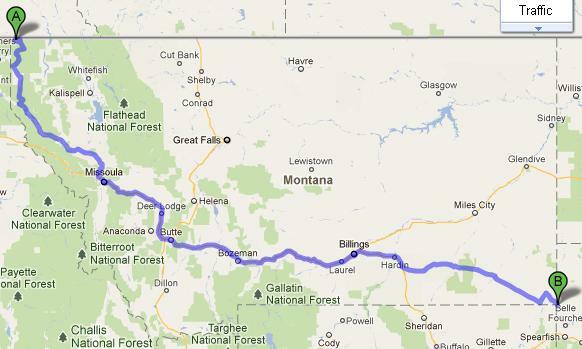 I’m convinced a point-to-point drive in Idaho can easily eclipse 800 miles (maybe even venturing near the 900 number). Trying to tame a route through the Idaho Panhandle without Google wanting to take you elsewhere is troublesome, plus you have all those remote, windy roads in the Idaho Panhandle National Forest to deal with. A rough, sketchy route that skirted into Washington from the Panhandle to the tri-point with Utah and Wyoming mapped out an 870-mile route for me. Having never been to Rhode Island (one of the 19 states I’m missing – and the only one in the northeast) I can see why it’s so easy to bypass. I had an impossible time mapping a route that was 70+ miles at its shortest. Anyway, for some “extreme” Rhode Island road tripping, start at Burnt Swamp road in the NE corner and head to Lighthouse Road in Watch Hill. You should be there in about an hour and a half. 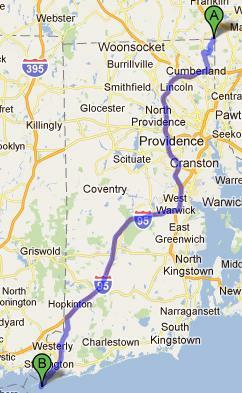 Crazy to think the longest point-to-point route in Rhode Island is only about 53 miles longer than one in Washington, DC. If someone wants to add to this, feel free. I’m not completely sure I have found the longest route in any of these states and there might be some states that clock in surprisingly high (or low). It would be interesting to find the extreme point-to-point drives for all 50. If anyone is up for that, go right ahead! Thanks for doing this work and posting the info! As a Tampa Bay resident, I’ve often been to the extremes of Florida, Key West to Pensacola and knew that you could drive a full half-day non-stop without leaving the state. Having been to the continental 49 states, I wondered if Flo would match up with Texas and Cali. Didn’t think of Alaska because I didn’t know whether there were coast-to-coast roads in the interior. I knew you couldn’t take a route down the panhandle (having visited “locked-up” Juneau). You can get 647 miles in Oklahoma by driving from the Preston Monument in Kenton, OK (intersection of OK, NM, and CO borders in the panhandle) to the end of southeasternmost road (33.6529113,-94.4861954) in Haworth. Just came across your post wondering the same thing. 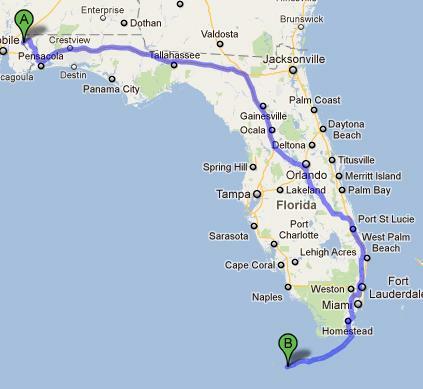 Surprisingly, you can go 650 miles and a whopping 11.5 hours from Ocracoke to Wolf Creek, North Carolina. I counted the ferry trip because it is an extension of NC Route 12.